You know better than anyone how complicated matters of the heart can be. Despite your best efforts, your marriage is no longer working and you’re facing the real possibility of a divorce. If you have children, you’re most likely very concerned about how this decision will impact their lives. You might also be feeling added pressure and anxiety over who will get custody and who will have to pay child support. In the face of such emotional family conflict, it’s essential to find an attorney who you can confide in and trust; someone who can truly empathize with what you’re going through. I began my own family law practice so that I could exclusively focus on helping individuals and families navigate through the difficult times in their lives. My number one goal is to protect your rights throughout the entire legal process; and to make sure you land back on your feet with financial security and hope for a bright future. I would love to learn more about your particular situation — let’s setup a time to talk! During your Free consultation, you can ask me questions and share any concerns you may have. I will provide you with all the legal options available to you. Together, we can determine a plan of action you feel comfortable with. I’m here to help and look forward to meeting you. My approach at the beginning of every case is to encourage an environment of cooperation between all parties involved. The more amicable the communication is, the quicker it is to reach a mutually beneficial settlement. A non-confrontational approach is also in the best interests of the children if any are involved. I have an excellent track record in successfully negotiating in mediation to reach compromise. When this is achieved, we avoid having to go to trial. The reality is, sometimes there is too much ill will between spouses to have constructive discussions. When this happens, the case can become time consuming and expensive. Regardless of how contentious the debate, I am always fully prepared to aggressively litigate your demands before the judge. In addition to my negotiating skills, I have a deep background in litigation which is an advantage to my clients during hotly contested divorce and custody battles. Prior to starting my own practice, I spent many years in criminal law both as a public defender and prosecutor. As a prosecutor, I was promoted numerous times within the office through the DUI division, juvenile division, and felony division. As a felony prosecutor, I was responsible for prosecuting numerous high-profile cases and became the senior prosecuting attorney in her division, maintaining a winning trial record. To be eligible to file for divorce in Georgia, you must have lived in the state for at least six months prior to filing a divorce action. If you meet the residency requirement, you can file a petition or complaint for divorce with the Court Clerk for the Superior Court in the county in which your spouse lives. Other grounds for divorce include adultery, habitual intoxication and abandonment. Your spouse will be served with the petition and has 30 days to file an answer with the court. He/she may contest the reason claimed for the divorce or contest the claims for child custody, child support, alimony or property division. The major issues that need to be resolved in a divorce are: dividing marital property and assets; debt allocation; determining eligibility of alimony and amount of support; and child custody and child support. Can I get or will I owe Alimony payments? Alimony or spousal support is court ordered financial assistance provided by one spouse to another. Temporary alimony may be awarded if you need support during the divorce proceedings. Permanent alimony is given for a fixed period of time after the divorce or for a lifetime. Georgia is an “equitable distribution” state which means that all marital property acquired during the marriage is divided equally. Marital assets acquired during the marriage include real estate, stocks and bonds, automobiles, income, and some insurance policies. Division of property does not necessarily mean a physical division. Rather, the court awards each spouse a percentage of the total value of the property. Each spouse gets items whose worth adds up to his or her percentage. In practice, often two-thirds of the assets go to the higher wage earner and one-third to the other spouse. Each spouse may keep their own separate property which refers to: inheritances; gifts individually received from family and friends; and property purchased with separate funds before the marriage. If you and your spouse can agree on how to divide the assets and debts among yourselves then you don’t need the judge’s input. If you cannot agree, you submit a property dispute to the court which will use state law to divide the property. When making custody determinations, Georgia puts the best interests of the children first. 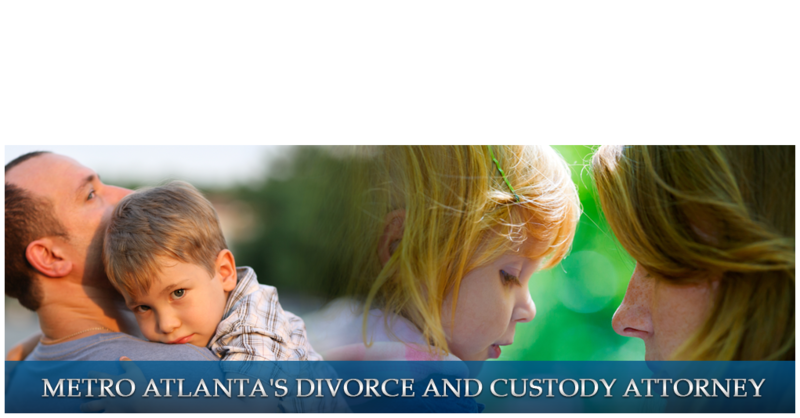 Georgia custody laws awards two types of custody: legal custody and physical custody. Legal custody is the right to make major decisions regarding the children such as their medical care, education, religion, extracurricular activities, etc. With joint legal custody, both parents will have equal rights and responsibilities to make major decisions concerning the children. Sole legal custody gives one parent the authority to make major decisions concerning the children. With joint physical custody, both parents will share substantially equal time and contact with the children and the children will enjoy a “dual residence” arrangement. Sole physical custody lets the children reside with one parent and visitation may be awarded to the non-custodial parent. If you have children who are 14 years or older they can make a custody election about which parent they would prefer to live with. However, a judge can overrule the custody election if the judge decides that living with the child’s preferred parent is not in the child’s best interests. No. The parents are equal in the eyes of the law. There is no presumption that the child should live with the mother or the father. The judge will make a determination based on the evidence presented in court what is in the best interest and welfare of the children. Visitation Schedule including how holidays, birthdays, vacations, school breaks, and other special occasions will be spent. Transportation arrangements, including how and where the child will be exchanged and how transportation costs will be paid. Allocation of decision-making authority with regard to the child’s education, health, extracurricular activities, and religious upbringing. If you and your spouse want equal decision making responsibility, the parenting plan will outline how to resolve a situation in which you both disagree. In determining child support, the court will generally award child support to the custodial parent and the non-custodial parent will pay some amount of monthly child support. The finances and earned income of both you and your spouse will be examined to determine the ability of each to pay. If one spouse has been out of the workforce in order to raise the children, the court will investigate that spouse’s earning potential if he or she were to re-enter the workforce. An uncontested divorce may be granted 31 days after the petition for divorce has been served. If there is disagreement on certain issues, the divorce will be obtained when the case reaches the court, which can take many months. A judge will not issue a final judgment decree of divorce until all issues of marriage have been resolved either by settlement or trial. Contact attorney Elyssa Korman Williams today to explore your options during a divorce settlement or child custody case.